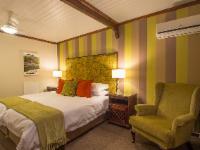 The Knysna Log-Inn embodies an indigenous concept that combines the character and spirit of the surrounding indigenous forests with Knysna's romantic history. On entering the lobby of one of the largest log structures in the Southern Hemisphere, exquisitely carved solid Yellowwood trunks tower upwards to the magnificent Scandinavian hammer trusses. Rays of sunshine flooding through the spectacular stained glass windows illuminate the splendid solid Yellowwood staircase. Payment: Individual: 100% deposit to secure. Groups: 100% deposit to secure. Deposit payment can be made online per credit card or by direct deposit to SafariNow, The balance is payable to the hotel per credit card or bank deposit. 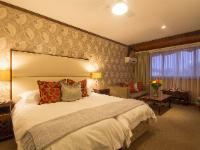 My partner and I thoroughly enjoyed our stay at Knysna Log-Inn from 7th - 13th January 2014. The room was very comfortable and neat, the staff were wonderful and polite and courteous at all times.The breakfasts were enjoyable and well presented. Would definitely stay there again. Would also recommend it to any one else visiting Knysna in the future. Fantastic!!! Great service, friendly staff. A wonderful place to stay. Staff are extreemly helpful - thank you! Thanks for a great stay! See you next year for the Oyster Festival!! Second time staying at Knysna Log Inn. Small problem in bathroom, but quick to re-locate us to another room. No complaints and would be happy to return. Swimming pool is a nice addition since our first visit. 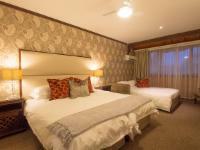 Knysna Log-Inn is 0.3km from the centre of Knysna Central , the nearest airport 73.9km (George Airport).